One of the happiest things I know on this earth is a good mosaic. Note to self...must find more time to make mosaics! Today I happened upon this artist from Brighton, England, and just had to share. 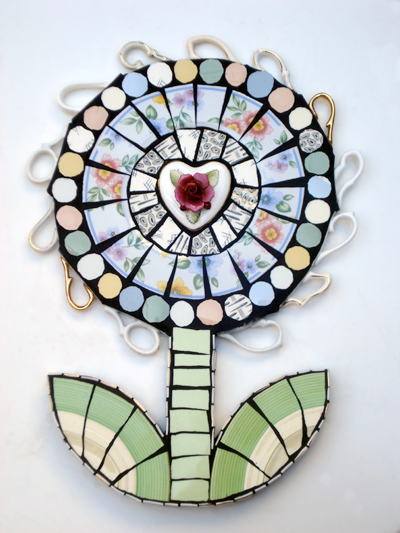 Anna Tilson has been working with her mosaic arts since 1999, and she's creating some absolutely wonderful pieces with vintage crockery. This beauty is available at her notonthehighstreet.com store. I'm drawn to this next piece because Anna used the stamps from the back of vintage crockery - and it's the history behind a piece like this which really draws me in. Think of all the people who's lives have somehow touched this piece. Was it the butler at the Queen's palace? Or the Smithers family down the row who's dog waits patiently for dinner scraps to come his way. The stories, the lives. Amazing, really. And she knows what to do with those pesky handles that break off. This next piece...well, it just makes me happy! Have you tried mosaic before? I highly recommend it. I've made a few of my pieces here in Sweden, but I really need to get busy and create more. I can feel my happiness meter going up just thinking about it! just stumnbled across your blog via twitter - its fabulous! love that mirror too. Could find a bunch of markings on dishes at thrift stores! Thanks for sharing! Love mosaic although I've never tried doing it myself. These are all so neat! I'm doing a giveaway hosted by a author of a really cool book you should check it out at my page, its open to worldwide! I have "learn how to mosaic" on my to do list this year!